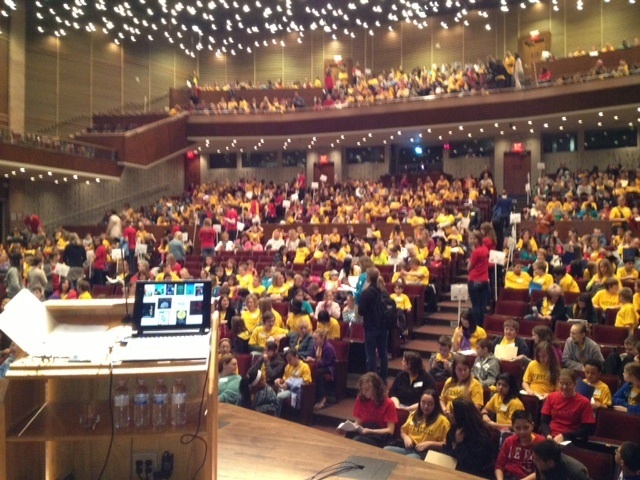 I just returned from a wonderful, two-night trip to Grand Rapids, Michigan, where I was invited (by Gary Schmidt!) 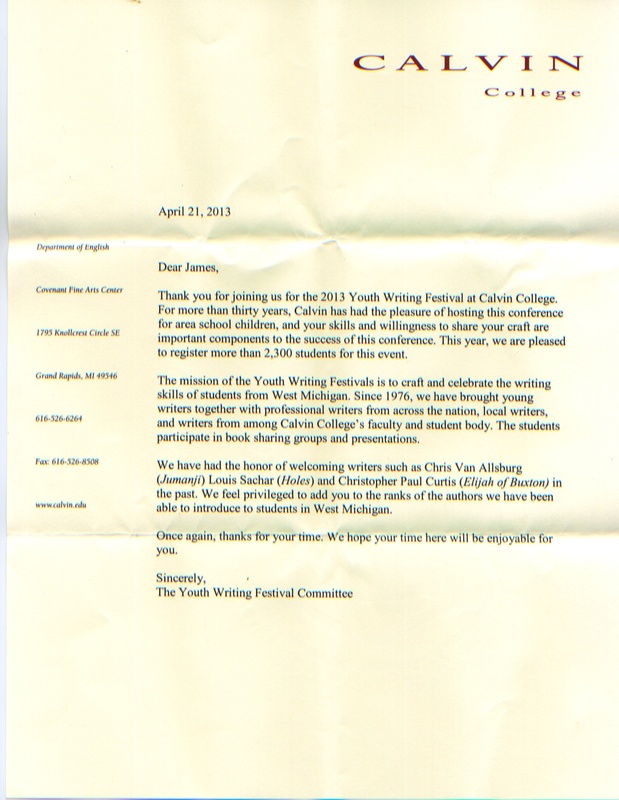 to participate in the 2013 Youth Writing Festival at Calvin College. As my Nation of Readers is well aware, I do many visits — particularly at this time of year. It’s fun, it’s beautiful to meet those children, and it’s work. Most visits are great, a few decidedly less so (oh, the stories I could tell), and every once in a while the entirety of a visit feels like a blessing. Like I’m the luckiest guy in town. That’s how I felt for my entire trip at Calvin. I was surrounded by caring, dedicated teachers and volunteers who could not have possibly treated me with more kindness. These folks did it right every step of the way, and I am grateful to all of them (Gary, Judy, Don, Kristin, Nancy, Debbie . . . far, far too many folks to name, from the President of the College who invited us into his home to the student volunteers who assisted us in countless ways). I certainly don’t need to be treated like a big deal, and it’s not anything I’ll ever actually believe, but it’s awfully nice when it happens. As an added bonus, I had the pleasure of meeting artist E.B. Lewis, a dignified man of talent, character, and intelligence. I picked up a copy of his latest book, Each Kindness, written by the great Jacqueline Woodson. I love this book’s focus on kindness. And, yes, that sad ending of lost opportunity hits me dang in the heart, hard. Since I first published Bystander in 2009, I’ve all seen a massive shift in focus on the issue of bullying in the media and in our schools. To the point where it almost feels . . . not over-stated, that’s the wrong word, but somehow . . . misguided at times. Students, especially, seem wary of being talked down to, lectured at, scolded. Hit over the head with the topic, turned off. You have to find a way to bring them to the core values, I think, and I believe that A GOOD STORY is far more effective at building empathy than a list of do’s and don’ts. I suppose my radar has been, perhaps, more finely attuned to the issue over the past few years. I don’t really believe in talking about “bullying,” per say, since I don’t think that should be the main subject. I believe it’s more basic than that, for “bullying” is just a sub-set of more significant themes for our children to encounter, consider, and embrace. One trend that I really like (see R.J. Palacio’s Wonder as a prime example) is a renewed focus on the simple things at the heart of the matter: how we should treat each other. Words like empathy, decency, tolerance, compassion, and kindness. Basic human kindness. Being a good person. Or questions like: How do you think it feels? How would you like to be treated? This book powerfully expresses those ideas (and ideals). 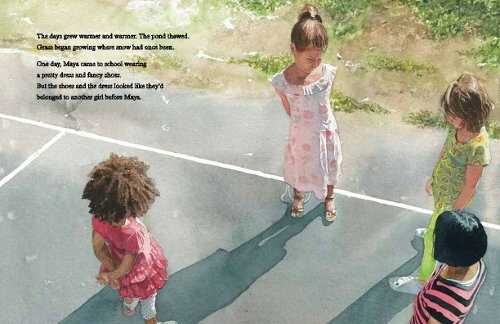 We learn by meeting characters, by stepping in their shoes, by imagining their feelings, the rumblings in their hearts. We learn through the power of story — that essential human art form that’s been with us since cave dwellers gathered around the fire. 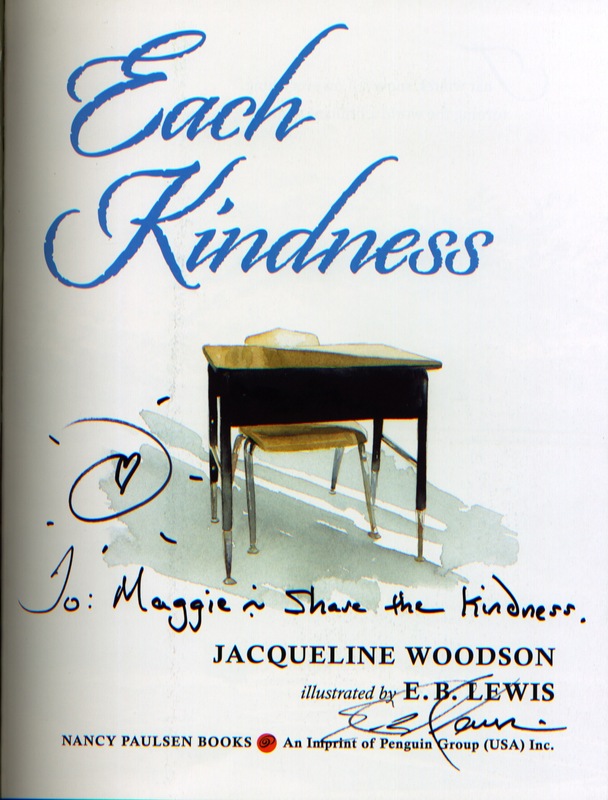 I highly, highly recommend the book, Each Kindness. I even got a signed copy for my daughter. And thank you, everyone at Calvin College, for a trip I’ll long remember.